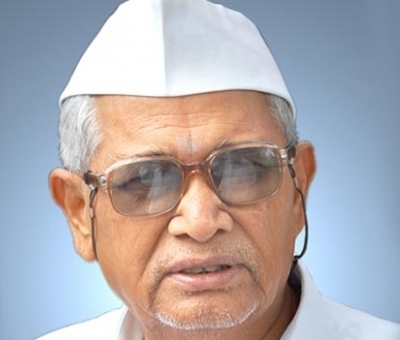 Former Union Minister and Congress leader Eknathrao alias 'Balasaheb' Vikhe Patil passed away at his residence in Loni village in Ahmednagar district of Maharashtra on Friday evening following prolonged illness, his family said. He was 84. Last rites of the veteran leader would be conducted with full state honours at Loni at noon on Saturday, district collector Anil Kawade said. Vikhe Patil largely kept away from public life in the last couple of years due to his illness. His son Radhakrishna Vikhe Patil is a senior Congress leader and currently the Leader of Opposition in the state assembly. Though a Congressman most of his career, Balasaheb was elected to Lok Sabha on Shiv Sena ticket in 1998 and became Minister of State for Finance in the NDA government. He was subsequently elevated as Minister for Heavy Industries. He returned to the Congress fold in 2004. His father, Vitthalrao Vikhe-Patil, was instrumental in setting up Asia's first cooperative sugar mill at Loni. Born on April 10, 1932, Balasaheb Vikhe Patil first entered the Lok Sabha in 1971 from Ahmednagar district and continued to represent Kopargaon Lok Sabha constituency for the next 20 years. He also had a brief stint as president of Maharashtra Samajwadi Congress, a Congress splinter group, during 1977-79. Vikhe Patil family commanded a strong political base in the Ahmednagar area through a network of cooperative societies and educational institutes including medical and engineering colleges. He was also a founder president of Maharashtra Pani Parishad, an NGO which focused on efficient use of water and training of farmers. He received Padma Bhushan in 2010. Maharashtra Chief Minister Devendra Fadnavis said in his condolence message that in Vikhe Patil's demise, the state had lost an eminent personality in the field of cooperation and rural development. Vikhe Patil's Pravara Trust was in the forefront in the education sector and introduced new concepts of learning methods, he noted. An astute commentator on water-management, agriculture and cooperation, Vikhe Patil prioritised rural development when he was Union Minister of State for Finance, he said. NCP president Sharad Pawar said, "Balasaheb's study and work in water-related issues was helpful for the then state government under my leadership in framing the water distribution policy. "He got elected to Parliament eight times where he continued his agenda of water-related issues. His contribution to the society also includes work in cooperation, educational institutes and measures taken for betterment of agricultural sector over the last few decades," Pawar said. Maharashtra Governor Ch Vidyasagar Rao called Vikhe Patil "a towering leader in the cooperation movement". "His knowledge of agriculture, irrigation and rural development was remarkable," the Governor said in his message, adding that in his demise, Maharashtra had lost a visionary leader and a great human being. State Congress chief Ashok Chavan said, "We have lost a leader who was well-connected with the people. His five decade long political tenure was focused on the betterment of rural and underprivileged class. His studious approach has not only contributed significantly in cooperation and agriculture sectors, but his efforts have helped the sons and daughters of sugarcane harvesters to get access to school education."